EUGENE, Ore. – Sept. 18, 2018 – University of Oregon chemists have created a new class of fluorescent dyes that function in water and emit colors based solely on the diameter of circular nanotubes made of carbon and hydrogen. The six-member team reported the discovery, which is now being explored for its potential use in biological imaging, in an open-access paper published online Aug. 30, ahead of print in the journal ACS Central Science. The paper details how the synthesized organic molecules called nanohoops, which initially were not water soluble, were manipulated with a chemical side chain to allow them to pass through cell membranes and maintain their colors within live cells. For years, scientists involved in biological research and medical diagnostics have relied on chemical compounds called fluorophores, which have flat structures and emit different colors upon light excitation, to label specific biological molecules. The potential for circular structures to provide new fluorescent properties is far less explored. 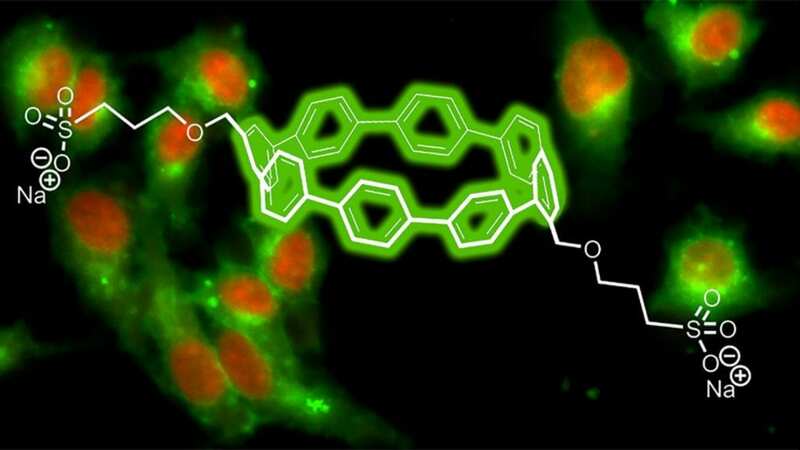 Nanohoops, which are short circular slices of carbon nanotubes, could allow for the use of multiple fluorescent colors, triggered by a single excitation, to simultaneously track multiple activities in live cells, said study co-author Ramesh Jasti, a professor in the UO's Department of Chemistry and Biochemistry and member of the Materials Science Institute. "The fluorescence of the nanohoops is modulated differently than most common fluorophores, which suggests that there are unique opportunities for using these nanohoop dyes in sensing applications," said co-author Michael Pluth, also a professor in the UO's Department of Chemistry and Biochemistry. "These dyes retain their fluorescence at a broad range of pH values, making them functional and stable fluorophores across a wide range of acidic and basic conditions." Researchers in the Jasti and Pluth labs collaborated on the research, which was funded by the National Science Foundation, National Institutes of Health, Sloan Foundation and Camille and Henry Dreyfus Foundation. The nanohoops have a precise atomic composition, Jasti said. Once a chemical sidechain was designed by the study's lead author Brittany M. White, a doctoral student in Jasti's lab, the nanohoops became soluble and passed freely through cellular membranes but didn't go to particular sites. "Circular structures like these nanohoops dissolve in aqueous media better than flat structures," Jasti said. "We figured this out by just doing it. It wasn't part of the plan. We just wanted to make carbon nanostructures in an ultrapure way. The bright emissions from the different sizes they produced just happened. It is a nanoscale phenomenon." In a next step, co-author Yu Zhao, a postdoctoral researcher in Pluth's lab, explored where the nanohoops were going inside cells and whether they can be guided to particular sites inside of cells. An added sidechain containing folic acid led the nanohoops to cancer cells. "That success told us that these nanohoops can be trafficked to different types of cells or even to intracellular compartments," Jasti said. "This also suggested their possible use in medical diagnostics or even drug delivery, because our nanohoops can easily carry little compartments that will go to specific locations." Toxicity levels of the nanohoops, he added, are no different than in traditionally used fluorescent dyes. In a newly funded effort, Jasti is working with Xiaolin Nan of the Department of Biomedical Engineering at Oregon Health & Science University in Portland to pursue the use of the nanohoops in biological imaging. The project is among 10 funded under the 2018 OHSU-UO Collaborative Seed Grant program. Pluth is a recipient of a separate seed grant in the program. "We have seen nothing like these nanohoops in the world of dye chemistry before," said study co-author Bruce P. Branchaud, professor emeritus of chemistry and biochemistry at the UO and distinguished scientist in the Cancer Early Detection Advanced Research Center of OHSU's Knight Cancer Institute. "All other dyes have been flat, whereas these nanohoops are non-planar circles," he said. "Their unique structures provide unique properties that we intend to develop and exploit for significant new contributions to chemical biology, biotechnology, biomedical sciences and medicine." Taryn E. Kawashima, winner of a 2016 undergraduate fellowship award by the UO Office of the Vice President for Research and Innovation, also was a co-author on the study.